Apple's Get a Mac ads. But are they here? Ever since that stunning 1984 Superbowl appearance Apple has always produced formidable ads even in times when you couldn't say the same about its products – the Think Different campaign of the 1990s is particularly memorable. The last decade has obviously been momentous in the extreme for the company, so let's look back over the last 10 years to some very special ads – some more memorable than others, but all uniquely Apple. We'll stress that these are our own favourites – doubtless there will be others that you like – as well as some of these you don't - so feel free to add links to extras in the comments below. A classic Apple ad in every sense: great Hendrix soundtrack; simple visuals; forceful voiceover. Shame about the Mac though - 2000's G4 Cube was a fantastic-looking forerunner to the Mac Mini but it was eye-wateringly expensive while numerous problems beset the model, not least hairline cracks appearing in the moulding. Another quite bizarre ad, this time for the iBook G4 where a chap requests a middle-seat so he can edit video, spread his media out, draw in his two neighbouring passengers and then annoy the rest of the plane with Who let the dogs out? Why? 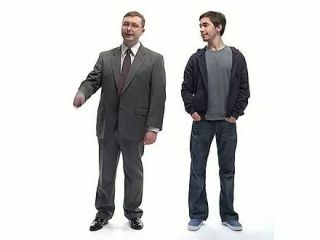 Designed to encourage disgruntled PC users to give the Mac a try and appearing in the wake of the release of Windows XP and OS X, the Switch ad talked about the frustration of using a PC compared to the slick experience of the Mac. It featured 'normal people' such as student Ellen Feiss, who not only appeared by accident but created a stir, not least because of a false rumour that she was on drugs at the time the ad was shot. The forerunner to the "Get a Mac" campaign. The long-necked second-gen 2002-2004 design for the iMac certainly turned heads even if the fun didn't last long. The replacement iMac G5 was dull in comparison. This entertaining ad shows the iMac posing in a shop window, showing off to a passer by. Classically simple. While the initial iPod ad retained the classic 'Think Different' slogan and style, it's the classic black silhouettes and white headphones imagery that still represents the iPod today. This ad for the iPod and iTunes combo coming to Windows epitomises Apple in the naughties and is the forerunner to the more modern artist iTunes ads below. As you'd expect, the soundtrack is also vibrant, Hey Mama from the Black Eyed Peas. The ad is unusual for Apple as it features no music. "Introducing the PowerMac G5, the world's fastest, most powerful personal computer" drawls Jeff Goldblum after a man has been blown out of his house by the sheer power of the Mac. The machine looks unscathed and has nothing on the desktop, so we suspect some kind of terrorist action instead.